Today is the 105th anniversary of the 1906 San Francisco earthquake. It’s a good day to celebrate the beauty of the city that I love. This was taken last November in the San Francisco National Cemetery. I’d been sick for weeks, but on Veterans Day, I finally felt well enough to take a walk in the sunshine. San Francisco obliged with a beautiful fall day. I’m not sure if I’ve ever hiked to the top of the graveyard before, but as I strolled back down toward the bay, I was struck by the martial precision of the lines of headstones climbing over the curves of the hills. 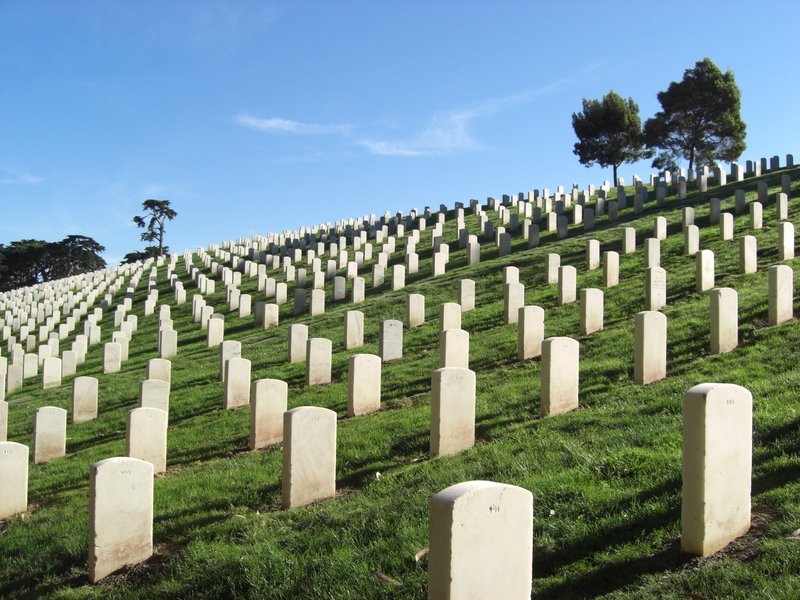 San Francisco National Cemetery is an unusual military cemetery in that it contains a number of normal tombstones amongst the standard government-issue markers. On this side of the cemetery, however, identical stones march in parallel ranks, a visual monument recalling the soldiers buried below. This entry was posted in Photo Challenges and tagged Bay Area cemeteries, California cemeteries, military cemetery, postaweek2011, San Francisco cemetery, San Francisco National Cemetery. Bookmark the permalink.